BMC Software recently launched the latest version of its workload automation software-and Enterprise Management Associates (EMA) took it for a test drive. 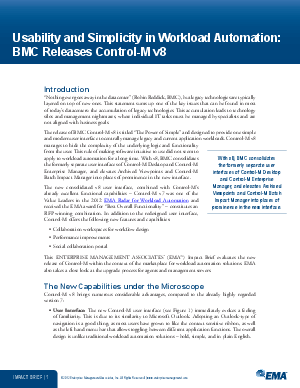 Read EMA's "Usability and Simplicity in Workload Automation: BMC Releases Control-M V8" to get a detailed evaluation of BMC Control-M V8. Learn about the new capabilities, including a consolidated interface, virtual workspaces, and increased performance. You'll also find information about the upgrade process, which features an easy, wizard-based installer, and get EMA's perspective on BMC Control-M V8 within the context of the current workload automation landscape.